reflective safety tape can stick to any surface and can withstand extreme temperatures. It is popular used for home safety, road markings, transport facilities, vehicles, ships, fairways, and mechanical equipment, and anywhere you need to mark. Size: 2 inch Width X 30 feet Length reflective tape. High Quaility: Specializing in the production of reflective tape for over 10 years, and providing brighter and more durable reflector tape for customers. 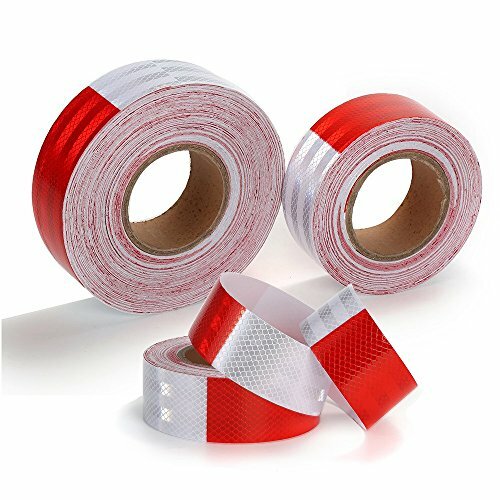 Ultra Reflective: Honeycomb Pattern design (PET Material) dot tape, high visibility red and white colors with reflective sheets on ensure the reflective safety tape reflect light better in the dark. Industrial Strength Adhesive: The reflective tape can be sticked on any surface, metal, wood, plastic and nylon. Works For:The dot reflective tape is great for trailers and other agricultural equipment, Campers, Boats, clothing, helmet, cars, bicycles, motorcycle and mailboxes. If you have any questions about this product by Knit, contact us by completing and submitting the form below. If you are looking for a specif part number, please include it with your message.